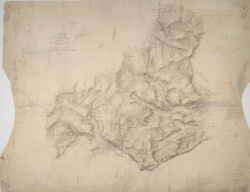 The scale of the drawing is noted, and the area mapped recorded as 67.5371 square miles. Archaeological sites are named in gothic script. Colour washes are combined with numerical annotations to indicate the relative relief and height of the hills.